A cutting edge Publisher of Genre Fiction, Pro Se Productions announces the release of a collection that is equal parts crime, mystery, and noir with pure pulp running through its printed veins. Harkening back to the gritty tales of the 1950s as well as tipping its fedora to old time radio’s influence, The Ninth Circle is now available in print and digital formats. Every City has one. That place, neighborhood, or borough where the forgotten live, where the once great land when they fall, where the tarnished and corrupt shine and where Justice and Fairness caught the last train out of town. Welcome to the Ninth Circle. The 9th Precinct is known as ‘The Ninth Circle’ or “The Dante Precinct’. The part of town where all the losers end up. If you work for a company or the city government and they want to get rid of you, they put you in their office or working over on Last Chance Lane. If you’re a criminal and you’re hiding from the law, other criminals, and yourself, you end up in the Ninth Circle. Imagine the city as a dumpster. The rank and fetid, the foul and odorous, the really discarded and misused trash all sinks to the bottom. They all end up in the Ninth Circle. Join Tommy Hancock, R. P. Steeves, and C. William Russette as they introduce the people that populate the city’s last stop to nowhere. Dirty cops, mysterious priests, shadowy nurses, a man with no name, and more are the lifeblood of The Ninth Circle. From Pro Se Productions. 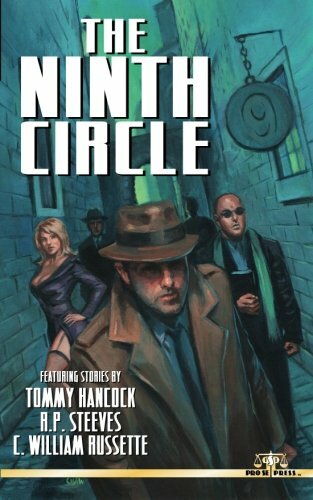 The Ninth Circle features evocative and atmospheric cover art by Adam Shaw, logo design and print formatting by Percival Constantine, and eBook formatting by Russ Anderson. This debut digest anthology is available for $9.00 via Amazon at http://tinyurl.com/ornzxrv and at Pro Se’s own store at http://tinyurl.com/kmdcuba. It is also available as an eBook for the Kindle at http://tinyurl.com/nbcu7cn and for most formats at http://tinyurl.com/lux3w8o for only $2.99. AUTHOR CHUCK MILLER'S FIRST STORY ARC IN PRO SE SINGLE SHOT SIGNATURE SERIES CONCLUDES-THE JOURNAL OF BLOODY MARY JANE EPISODE THREE DEBUTS!